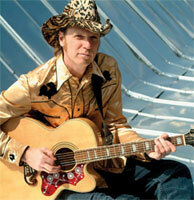 Chanteur Country US né le 22 Novembre 1958 en Illinois, Jason Ringenberg fut le leader de Jason & The Scorchers. While Gram Parsons may have the distinction of being the grandaddy of the ill-named "alt country" genre, Illinois farm boy Jason Ringenberg is certainly is certainly the man who brought the music-before the phrase was coined— to the stages of the world with a vengeance. Born in 1958 and raised on a pig farm in southern Illinois, Ringenberg moved to Nashville in 1981 to try his luck as a songwriter. He formed an acoustic country/punk band with drummer Jack Emerson called Jason & The Scorchers and released one EP in 1982 on the defunct Praxis label called Restless Country Soul. With additional members such as guitar slinger Warner Hodges, and bassist Jeff Johnson, the band, re-christened themselves Jason and the Nashville Scorchers with Perry Baggs replacing Emerson on the drum kit. The band and recorded their debut mini-album Fervor in 1983, that caused a stir among American critics. It was the group's live show, with its embodiment old time rock and roll energy, punk swagger and grit and country music's elegant excesses that won them fans worldwide. After Lost and Found was issued in 1985, Ringenberg had won enough celebrity to be berated publicly by country music's Ed Sullivan, Ralph Emery on live television and become a major concert attraction all over the globe. The band disbanded in 1990 and Ringenberg became a solo performer. His debut, One Foot In the Honky Tonk was met with critical praise but after being dismally promoted sank without a trace. The Scorchers reunited in the mid 1990s issuing fine studio albums and a live recording. Ringenberg did not give up his solo career, however, and recorded the simple, haunting acoustic masterpiece, a Pocketful of Soul on his own label in 2000 as well as the rollicking, All Over Creation featuring a boatload of guests in 2002, while continuing his touring and recording activities with the band. Ringenberg continues to be a very successful solo act when not playing with the Nashville Scorchers; he's toured the world three times in the 21st Century alone. In October of 2003, Ringenberg tossed everyone a curve ball by recording and releasing his first children's record on the Yep Roc label entitled A Day At The Farm With Farmer Jason.